Applications: Use with polishing or buffing compounds on stainless steel, brass, alloys and other metals. Product Notes: Available in 50 and 75mm diameter with Lockit (Roloc™) type fitting. Use lower speeds for finer finishing. 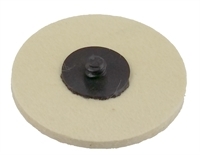 Also Available: Use after unitised pre-polishing discs to save a lot of time in bright or mirror polishing. We stock suitable back up pads and polishing compounds.